National parks, national historic sites, and national marine conservation areas represent the very best that Canada has to offer. As we enter into the 150th anniversary of Confederation in 2017, there is no better way to celebrate and learn more about our environment and our heritage than to experience these national treasures first hand. Waterton Lakes National Park is a great place for winter adventures. From snow-covered mountains to great wildlife viewing and a charming community, a winter visit is sure to be special. Hundreds of elk often gather on the Blakiston Fan during the winter, and with Vimy Peak as a backdrop, it’s a truly spectacular sighting. You may see other wildlife in the park too, such as moose, bighorn sheep, coyotes and bald eagles. In the village, you are likely to see deer and red squirrels. 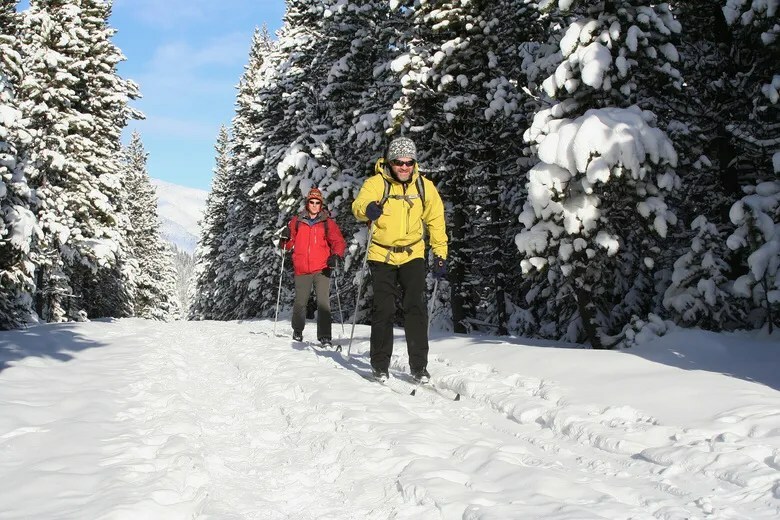 If you would like to try snowshoeing, the Crandell Lake trail is a popular route. It is 2.5 kilometres (about one hour) to the lake and more protected from the winds than other trails. There’s a shelter at the lake so don’t forget to bring a snack and some hot chocolate. Visiting Cameron Lake on a winter day is unforgettable. You can snowshoe or cross-country ski to this beautiful lake from the Little Prairie picnic shelter. There’s a great chance you will see winter birds such as Steller’s jays, Clark’s nutcrackers or Gray jays (Canada’s national bird according to the Royal Canadian Geographic Society). Don’t leave your snacks out or unattended so you don’t (accidentally but unlawfully) feed the birds. Although there may be ongoing construction at the day use area, the lake will be accessible. To add warmth to your winter adventure, enjoy a picnic with a crackling fire in one of our enclosed shelters at Pass Creek, Little Prairie or McNealy’s day use areas. Remember to bring along some firewood and refreshments. If you’d like to stay overnight, there are a few options. Winter camping is available at Pass Creek, with a kitchen shelter, wood stove and outhouses provided. Water is available from the creek (boil before use) or from the tap at the fire hall in the village. The newest accommodation is the Cameron Lake Cabin, recently renovated by the Alpine Club of Canada (ACC) to operate from Dec. 1 to April 30 every year. This rustic and historic cabin is in a clearing adjacent to the Akamina Parkway, approximately two kilometres from the Little Prairie trailhead and easily accessible by snowshoe or ski for people of all ages. Bookings are taken through the ACC reservation system: www.alpineclubofcanada.ca. You do not have to be members of the ACC to book the cabin. Two hotels are open in the winter: the Waterton Lakes Lodge (closed for three weeks in January) and Glacier Suites. Both offer snowshoe rentals, and the Lodge has a restaurant and skis for rent too. Wieners of Waterton is open on weekends. There is no gas station open in the winter, so it’s a good idea to fill up with fuel before heading into the park. Occasionally, big winter storms drop large amounts of snow, forcing temporary road closures. Be sure to check http://www.511.alberta.ca for road conditions before you start your trip. Waterton is a favourite winter destination for those with an adventurous spirit. You may spot ice climbers on the icefalls along the Akamina Parkway, and there are excellent opportunities for ski touring. Visitors involved in these backcountry activities should carry and know how to use avalanche equipment, have knowledge of avalanche conditions and route evaluation and be capable of self-rescue. Please refer to our website for avalanche bulletins and the weather report for current conditions. Skiers travelling off designated trails, or anyone undertaking what may be considered a hazardous activity, should tell a family member or friend about what they’re doing, where they’re going and when they will return. For additional information on the park and winter activities: visit www.parkscanada.gc.ca/waterton; email us at waterton.info@pc.gc.ca; phone 403-859-5133. Follow us on Twitter, @WatertonLakesNP or like us on Facebook, Waterton Lakes National Park.